Do you chill out with friends after a hard day’s work? Is the guitar your favorite instrument to rock or to relax? If you’re a fan of the Guitar Hero series, in particular, there is a new line of guitar peripherals arriving on the scene. The first to roll out is a cool wireless guitar controller for Playstation 2 and 3. Why is it so cool? 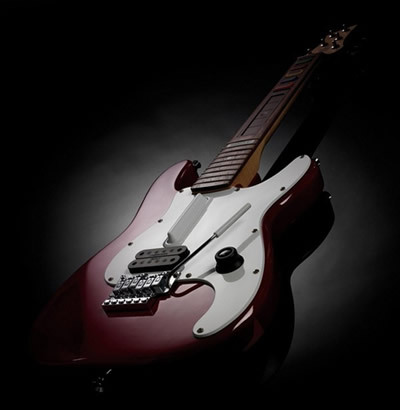 The guitar controller has authentic wood neck, rosewood fingerboard, metal frets, and metal turning handles. It has a touch-sensitive neck slider and star power button as for users to take advantage of unique Guitar Hero® World Tour features. It is compatible with PLAYSTATION®3 and PlayStation®2 and comes with 2.4 GHz wireless USB receiver. It has 10m (30ft) wireless range and comes complete with a guitar controller strap and a bonus gig bag. This high-end accessory definitely comes with a price – $250. What is great though is that the guitar controller reduces button noise to the minimum. It also supports new functions in Guitar Hero IV through its awesome touch-sensitive neck slider. While it may not be for everyone, this superb guitar controller can unleash the inner rocker in the right player. Have fun!